With Space 4 in a row you can have fun with your friends no matter where you are! 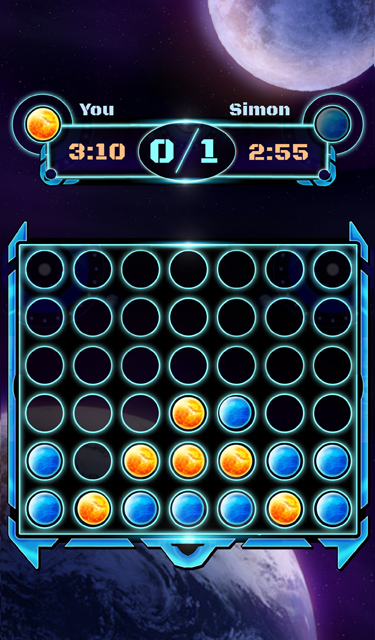 Space 4 in a row can be played at the same time on smartphones, tablets (iOS, Android, BlackBerry) and even PC’s. It is a classic 4 in a row with futuristic graphics from space. Even if you don’t want to play online with life opponents, you still can challenge the CPU, and prove that you are the best of the best! To play on you smartphone or tablet – enter this link (http://play.bushidogames.com/en-gb//games/space4inrow/en-gb/) into your mobile browser and play. To play on you PC/MAC – CLICK HERE. MULTIPLAYER FUN ON MOBILE AND STANDALONE PC! Block the opponent’s moves, and set your balls in rows to win.